Jordyn Woods is currently in London making money moves to secure the bag. 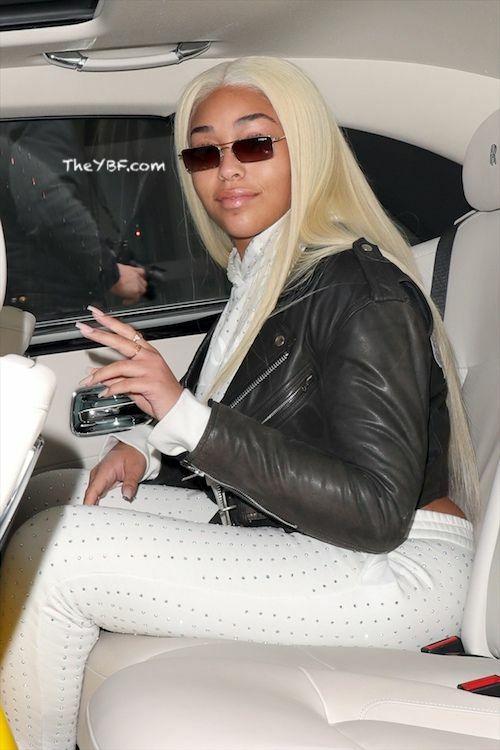 After causing a scene in Hollywood, Jordyn jetted to the UK with her momager Elizabeth Woods to host an event with Eylure to celebrate her new eyelash collection. Yep, the glow up is mad real. The 21-year-old whipped out blonde wiggery to make her London rounds today, arriving at the Dorsett Hotel in a crop top, matching joggers and Off-White x Jordan 1 Retro High sneakers. Her lash collection launch goes down today. Doesn't she remind you of Rob Kardashian's ex/Kim K's former bestie Blac Chyna in these candids? Is chick low key saying, "That'll teach 'em!" (one of Chyna's favorite sayings) in these flicks. We wish. Blac "Queen of Revenge" Chyna should send her one of those jackets she was spotted wearing. No more low key outings! The YBF hottie stepped out looking hot. A gold mini-dress, strappy high heels, a brown Sami Miro Vintage jacket, and a Louis Vuitton purse for dinner with her mom at Sushi Samba in Notting Hill. After the Tristan Thompson cheating scandal broke, it was rumored Jordyn and her former bestie Kylie Jenner were working to try and salvage what was left of their friendship. But, that doesn't seem to be the case any longer, if the rumors are true. Celebrating the lash launch tomorrow! can’t believe it’s been a year since we started creating them. According to TMZ, Jordyn and Kylie still “aren't talking” and “Kylie's given up on making up and is moving on.” Sources tell the site Jordyn's Red Table Talk interview with Jada Pinkett Smith "annoyed" Kylie even more and had the “opposite effect of winning Kylie back." And we're not even mad at that. Jordyn def needs better people in her inner circle. Look how she's flourishing now.